Amir Hall was limited to just one pass in the NFLPA Collegiate Bowl on Saturday, but the most important work was already done. 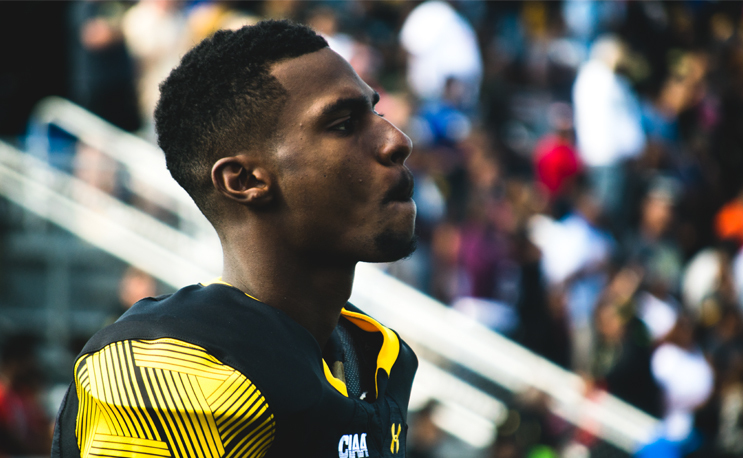 If you turned to the NFLPA Collegiate Bowl on Saturday to watch Amir Hall nationally debut his skills like most HBCU fans did, you were disappointed. The Bowie State quarterback made his debut on the field for the National team with 7:35 left in the third quarter, American and National tied at 7. National’s drive was ten plays and lasted just over five minutes. Nine of the ten plays were consecutive runs, so it was 3rd and 4 and the last play of the drive when Hall finally got a chance to throw. Unfortunately, the pass was deflected at the line. National went on to miss the field goal and that’s all we saw from Hall for the remainder of the game. One drive, one pass attempt. That is all you’ll find recorded in ESPN’s box score for Hall. The National team featured three quarterbacks in rotation and totaled 31 pass attempts. Jake Browning went 9-for-17 for 114 yards and two interceptions, Brent Stockstill went 5-for-13 for 71 yards, and Amir Hall had one incomplete pass attempt. The American team featured three quarterbacks as well but did a better job divvying up their 45 attempts; 19, 13, and 13 respectively. There was a loud contingent of disappointed Hall fans online. Wow.. really disappointed in the @NFLPABowl… Amir Hall didn’t get a shot to display his talents and fight for a chance to be drafted in a game you invited him to! They really let Amir Hall only throw one pass during his only time on the field at the #NFLPABowl ?? #NFLPABowl Someone has to explain why Amir Hall didn’t get to show off today🤦🏽‍♂️ 1 pass..Thats it!?? The truth of the matter is, it was deflating and unfortunate to see as an HBCU fan. Make no mistake, though, and don’t believe this ruined Hall’s chances to succeed. For the most part, only fans and prospective fans were affected by the slight feature. The fact remains that Hall was in California the entire week prior to Saturday’s game putting in the real dirty work: learning the business, networking with professionals, practicing and working out for scouts. Not only that, everyone loves an underdog, right? In all, the lack of limelight sucked, that’s undeniable. Hall’s NFL prospects shouldn’t have taken too much of a hit on Saturday afternoon, though. Alongside his other countless career accolades, he still ended his senior year first in passing yards in NCAA D2 football and a CIAA football champion with two conference records resting on his 6’5 shoulders. That’s something you can’t snub. Although he may not have gotten a fair share of attempts, he still went out there and made fans of HBCU football proud and root for him much louder. Proud of Amir Hall. That young man thru sheer talent and grit made it to the #NFLPACollegiateBowl from @BowieState . He did his teammates, school, conference and HBCU football proud. His football journey is not over. Now as always we see how HBCU athletes always have to be more exceptional with less opportunity! !